How do you solve a problem like Yves Saint Laurent? In 2014, two different French films sought to encapsulate the late designer&apos;s genius and emotional demons: one of the films was supported by Saint Laurent&apos;s partner, Pierre Berge — the other was not. 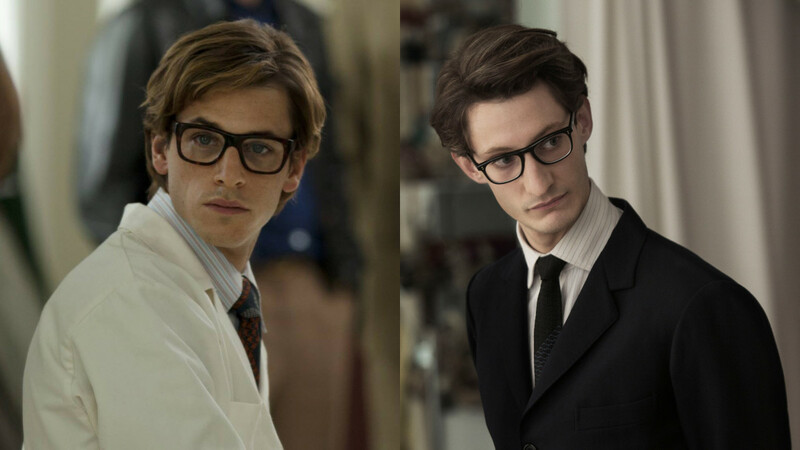 The authorized film, entitled "Yves Saint Laurent," was directed by Jalil Lespert and came out in U.S. theaters last summer (it is now available on Netflix). The unauthorized one, directed by Bertrand Bonello and titled "Saint Laurent," debuted at the Cannes Film Festival in May and is finally opening stateside in select theaters on Friday. So, which one should you watch? We compared the films by categories, from most charming muses to best fashion and more interesting plot. Read on for our verdict. Playing the role of a real person without coming across like a caricature is certainly challenging, and both actors avoided any heavy-handed impersonation. The lead role (and the acting overall), however, was much better in the unauthorized film. Gaspard Ulliel perfectly balances the designer&apos;s femininity — complete with a delicate high-pitched voice — and his powerful charisma. He convinces the audience that the designer could manipulate everyone around him into forgiving all of his transgressions and relentlessly protecting him from the pressures of the fashion world, even though many of his problems —the drug abuse and wild affairs, for example — are of his own doing. And while actor Pierre Niney of the authorized film plays a sympathetic character, his portrayal of the designer&apos;s descent into anxiety is too on the nose. The writing doesn&apos;t help either: everything is spelled out and simplified. Point - Bonello&apos;s film: Ulliel is a alluring, complex and maniacal. Both films cover some similar plot points: the designer&apos;s youthful innocence in his early years, his anxiety and escalating substance abuse, his complicated relationship with Berge, the pressure to be creative and the muses who inspire him. Both films feature Saint Laurent&apos;s torrid love affair with Jacques de Bascher and climax with the presentation of the Russian Ballet collection in 1976. And even though the unauthorized film doesn&apos;t cover the Dior years, it still feels much more complete. More time is dedicated to the inner politics of the women working in the atelier, Saint Laurent&apos;s drug-fueled hazes and his fascination with his muses. However, as a result, the unauthorized film is insanely long — 150 minutes versus the authorized film&apos;s 106 minutes. It&apos;s a draw: The unauthorized film has a more nuanced and comprehensive plot, but could have used editing. Neither of these films are documentaries, nor do they claim to be. Situations and characters are exaggerated and developed for the sake of plot. But Berge, who is notorious for being a control freak, wouldn&apos;t have given his endorsement if he disagreed with the depiction of the designer or himself. As a result, the main difference between the two films is that Saint Laurent is much more pure in the authorized version. He truly loves Berge despite his many trysts. He is a fashion genius trying to overcome his own mental illness, with Berge by his side as the disciplined yet tormented protector. The unauthorized film gives Saint Laurent more agency over his bad behavior and paints Berge as a self-motivated tyrant whose ability to keep the designer alive and the company afloat is as frightening as it is impressive. There is no doubting Berge&apos;s commitment and love for him, even after their initial sexual attraction to each other fades. No one is innocent of taking advantage of the excess that characterized the &apos;70s, and as a result, the film is really depressing. There is no redemption at the end of either film, actually, but it&apos;s much more bleak in the unauthorized version. Verdict: It&apos;s a draw: Bonello&apos;s film was free from Berge&apos;s influence, but took more creative liberties. Only the Berge-approved film was allowed to use actual designs from the Saint Laurent archive for filming and, not surprisingly, it makes a big difference — especially in the Russian Ballet collection scene. In Bonello&apos;s film, that collection looks like cheap costume, while in Lespert&apos;s there is no denying the quality of construction, even if the actresses are much less free in their movements down the runway. (Berge sent a handler for each look he lent to the set and the models were not allowed to sit down in the clothing.) Bonello&apos;s costume designer Anaïs Romand won a César award for her efforts, however, which did not look unrealistic in the rest of the film. Point - Lespert&apos;s film: There&apos;s no beating the originals. Saint Laurent&apos;s muses are critical inspiration points for his work, so they have to feel extremely alluring in the films, too. His muse at Dior, Victoire, only appears in the authorized film, but both feature Betty Catroux and Loulou de la Falaise, who were regulars in the designer&apos;s life in the &apos;60s and &apos;70s. The casting choices in the unauthorized film can&apos;t be beat: the beautiful Aymeline Valade was seemingly born to play the role of androgynous Catroux and Léa Seydoux is perfectly maternal yet sexual as de la Falaise. Lespert&apos;s Victoire isn&apos;t charming or interesting, even when she has a quick tryst with Berge. Verdict: Point - Bonello&apos;s film: It&apos;s no contest. Since Bonello&apos;s film is less preoccupied with Saint Laurent the man or his fashion, it spends more of its ample running time depicting the wild culture of Paris in the &apos;70s. Scenes of Betty whipping her hair back and forth in the disco or Saint Laurent walking into a hotel are exceptionally beautiful despite not furthering the plot. Its a hyper-saturated world of hallucinations, orgies and the crisp clean space of the atelier. Lespert&apos;s film seems muted in comparison. Point - Bonello&apos;s film. Which film is more entertaining? Bonello&apos;s version, without a doubt. However, if you are less interested in watching a two-and-half-hour long drug-fueled descent of a beauty-obsessed man and more interested in seeing archival fashion in motion and learning about Saint Laurent&apos;s career, go with Lespert&apos;s. Either way, there will be enough pensive sketching and dramatic runway walks to satisfy anyone fascinated by the designer&apos;s unique talent and tumultuous life.